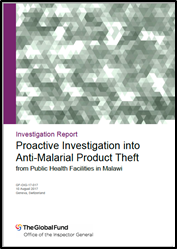 This information is from the report on a “proactive” investigation that the OIG conducted into anti-malarial product theft from public health facilities in Malawi. The report was released on 10 August 2017. The OIG normally conducts reactive investigations which are usually triggered by whistle-blowers or by information from the Secretariat. “The aim of a proactive investigation is to introduce an intelligence-led component to identify high fraud risk areas and determine if they have materialized,” the OIG said. Whatever the label, the report reads like a case study of the considerable efforts the OIG has expended over the years to try to resolve the problem of drug theft in Malawi. To date, the Global Fund has provided over $1.24 billion in grants to Malawi, including five grants totaling $167.5 million in support of Malawi’s National Malaria Control Program (NMCP). The program is dependent on the procurement and distribution of essential commodities, including anti-malarial drugs. Between 2009 and 2016, over $26 million in malaria grant funds were used to purchase over 7.5 million blister packs of artemisinin combination therapy (ACT) drugs, the most effective treatment for uncomplicated malaria. The OIG has partnered with USAID to organize public campaigns to encourage people to report instances of drug theft. I Speak Out Now!, the OIG’s campaign, and Make a Difference, the USAID’s counterpart, both use the same hotline numbers. From its launch in April 2016 to June 2017, a total of 114 reports were received by the hotline, of which 62 related to the diversion of ACTs from the public health system. However, the majority of the reports related to the illicit sale of ACTs, rather than their theft. The OIG has also worked closely with officials in the Malawi government, particularly the Drug Theft Investigations Unit (DTIU). The OIG reported that between August 2016 and April 2017, the DTIU, in conjunction with the Malawi Police Service, took action against 62 individuals suspected of stealing or selling medicines from the public health system. Of the 62 people, 16 were public health workers who were subsequently prosecuted for theft of medicines; to date, three of them have been convicted. Although public health workers may account for a portion of the thefts, the OIG said that it is not in a position to definitively identify one cause over another. It is much easier to find evidence of stolen drugs being sold than it is the find evidence of how the drugs are stolen. While the OIG has commissioned three “market surveys” in the last two years, and while the surveys have identified a number of private vendors and pharmacies illegally selling ACTs that had been purchased by the Global Fund and other donors, the surveys do not reveal the illicit channels through which these commodities have passed. The OIG said that although investigations that focus on the illegal sale of stolen medicines can eventually identify the sources of the medicines, this part often requires additional investigative steps, as well as additional time and resources. The OIG, therefore, is continuing to analyze the information received through the hotline, prioritizing the reports, and detailing where thefts are taking place and by whom, for local enforcement action. The OIG said that a number of “vulnerabilities” in the supply chain have been identified which could provide opportunities for theft. These include: non-reconciliation of stock data between deliveries, stock counts and stock cards; inadequate and ineffective systems and processes to account for commodities; and inadequate storage facilities. Aidspan has written about the problem of drug theft in Malawi before (see GFO article). Aidspan also reported on the OIG’s 2016 audit of grants to Malawi.